The 2016 PBA Commissioner’s Cup had an interesting Tuesday double=-header as the San Miguel Beermen and NLEX Road Warriors had to play through three overtimes before anyone came out the winner. Afterwards, the Rain or Shine Elasto-Painters used a searing second half surge to purge GlobalPort and eliminate the Batang Pier from quarterfinal contention. San Miguel import Tyler Wilkerson and NLEX reinforcement Al Thornton put on an incredible show as they tallied a whopping total of 127 points between them in a wild and entertaining triple-overtime affair that the Beermen won, 131-127, on Tuesday at the SMART-Araneta Coliseum. Thornton scored 69 big points, while Wilkerson had 58, but it was the latter walking out the happier of the two as his team came away with the win. San Miguel improved to 6-3 for the Oppo PBA Commissioner’s Cup while dropped to 5-5. Alex Cabagnot scored 20 points and dished out 12 assists while June Mar Fajardo added 18 points and 16 rebounds for the Beermen. Arwind Santos and Marcio Lassiter also reached double figures in scoring with 15 and 11, respectively. But it was the imports that stole the show in this one as they dominated scoring. Thornton scored his 69 on 26-of-47 (55-percent) shooting. He chipped in 39 of those in the fourth quarter and three overtimes. He also grabbed 19 rebounds. Wilkerson, meanwhile, had his 58 on a 20-for-35 (57-percent) shooting clip. He scored 11 points in the extra period including back-to-back baskets in the third OT that gave San Miguel a 129-123 lead heading into the final stretch. The Rain or Shine Elasto Painters formalized their entry in the Oppo PBA Commissioner’s Cup playoffs after routing GlobalPort, 116-94, on Tuesday at the SMART Araneta Coliseum. Import Mo Charlo notched a double-double with 18 points and 11 rebounds, while Jeff Chan knocked down four three-pointers to also finish with 18 as Rain or Shine booked its sixth win against four losses this conference. Paul Lee added 12 points – 10 of those in the fourth quarter – Jericho Cruz chipped in with 11 while Chris Tiu had 10. 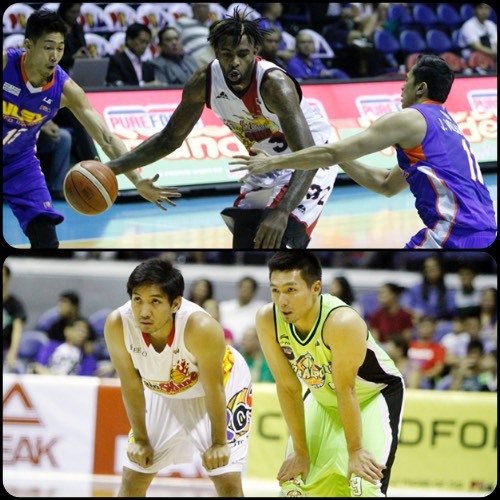 Two other players, Raymond Almazan and JR Quinahan, finished with nine apiece. The Elasto Painters are now assured of a place in the quarterfinals, although they are still playing for position in the standings. GlobalPort, behind the play of Shawn Taggart, who had 13 first half points and nine rebounds, and Terrence Romeo, who chipped in with 11, led at the halftime break, 49-44. The Elasto Painters outscored the Batang Pier, 35-21, in the pivotal third quarter with Charlo scoring 11 points and Chan adding eight in the period. They then opened the fourth with seven unanswered points – two from Almazan and five from Quinahan – to take a whopping 16-point lead, 86-70. Rain or Shine scored 72 points in the second half after mustering only 44 in the first two periods. Taggart ended up with 32 markers for GlobalPort, while Terrence Romeo added 19. Star guard Stanley Pringle sat out this match.